TIME FOR A RETHINK: The Sports Personality of the Year. SARAH LYNN and James White managed a first for the Apprentice (Final, BBC1) and became joint winners, sharing half £500,000 between them for their future business plans. I’m unsure whether it was an inspired twist or anticlimax to a steady series. Although the format is slick, the tasks tend to get a little repetitive at times as do Lord Sugar’s one liners. Ultimately though, the winner is chosen by a subjective final task which enabled the resulting stalemate. Viewing figures for the final were down 500,000 this year, but a new series is still planned for next year. As a long standing viewer of Coronation Street (ITV1) I have no problem with juicy storylines. What I am struggling with is the current trend for personality changes. Vicar, Billy Mayhew, Anna Windass and Chesney Brown have undergone ‘Mr Hyde like’ switches. Evil old Phelan doesn’t seem quite so sinister any more, or does he? Has BBC Sports Personality of the Year had its day? 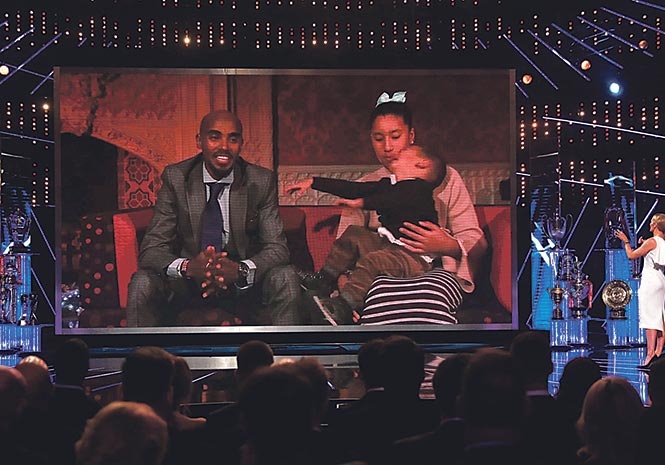 A chaotic finale laced with technical hitches and controversy left winner Mo Farah high and dry after his video link all the way from London embarrassingly broke down. The BBC has little live sport to speak of, relying on borrowed video clips to pad out the show. Mo Farah, our greatest ever athlete and 50/1 outsider won when he should have won in any of the five previous years was a final let-down with the live link crashing as the trophy was presented. With Chris Froome, our greatest road cyclist under a cloud of a failed drugs test, heavyweight boxer Anthony Joshua surprisingly not making the podium and both golf and rugby union ignored, it seemed the BBC were determined to represent their two last remaining live sports. Including a tennis player whose biggest achievement was a heavy defeat in the Wimbledon semifinal appeared desperate. As a yearly review of sport it’s a pleasant evening’s viewing, but voting figures were vastly down on previous years. ‘Britain’s Favourite Biscuit?’ (C5, 10pm, Tuesday) presented the information we all needed to know. Really? The result of a national survey, the show even had a ‘dunk test’ to show which biscuits fared the best in a cuppa. I’ve got to admit I’m not a big fan of biscuits, so perhaps am not best placed to comment. As incisive, entertaining TV it was a biscuit lover’s paradise, but I found it one long yawn. Vanessa Feltz discussing having an orgasmic experience while enjoying a Trio was possibly a step too far but the biggest omission was any mention of the greatest biscuit advert of all time. For the Breakaway advert in the 1970’s featuring Monty Python’s Eric Idle and his ‘nudge nudge, wink wink, say no more’ character to be left out just about put the tin lid on it for me. Would I Lie to You? At Christmas (BBC1, Monday). The funniest panel show and probably most rib-tickling experience on TV at the moment rarely fails to deliver. Star of the Christmas special was Henry ‘Blowers’ Blowfeld, sadly retired from cricket commentary this year showed no loss of humour as he recounted the time he phoned a female friend to invite her on holiday thinking she was someone else (he’d had a glass of wine or two at the time). She accepted and what happened when they met at the airport was comedy gold. Was he lying? It’s worth watching on catch up to find out. Enjoy your festive TV, best wishes.